I remember my first connection with the military community like it was yesterday! My concerns when I left my hometown for officer training school and pilot training in 1971 were certainly far less than the open fear of my family! All new military trainees and their families must face those same concerns and fears so when I saw the opportunity to listen to and question the Deputy Commanding General for Army Initial Military Training I quickly volunteered (I can do that now since I am retired - first rule, never volunteer was a common civilian warning before I entered the Air Force). I wanted to hear how the Army was adapting their new training programs. During today's DoD Roundtable we listened to Lieutenant General Mark Hertling, Training and Doctrine Command Deputy Commanding General - Initial Military Training, talking live from the the Initial Military Training Conference in Columbia, SC and Ft Jackson talk about Army “basic” training. 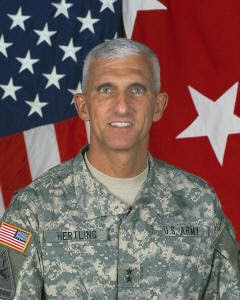 General Hertling said there were 200 leaders at the forum to review the progress of IMT since it was stood up in September 2009. They have had the chance to include lessons learned from our combat forces, added technological capabilities not available in the past and to better understand this new generation of soldiers. I asked him what the #1 task from the forum that he would take away for action. He said that he could not narrow it to one but spoke of three categories that needed to be addressed. First, the skills each soldier learns are fairly straight forward but have been reviewed for application to each soldier’s needs (more on that later). Second, the physical training of civilians in transition has been challenging based on our society’s reduced physical condition. He said that this generation of Americans were frequently obese, out of shape and not as physically able as previous generations! Wow! The key is to train them without “breaking them”. The third category was the inculcation of values and professional military ethos that most do not have. He said this was also a difficult challenge for the training program. To better understand the requirements of trainees the Army has begun a program to determine the baseline of “soldier resiliency” through testing of four areas: Societal, emotional, physical and spiritual. This can also be used later for assisting soldiers with injuries whether physical or emotional (PTSD or traumatic brain injury for examples). They have also evaluated the Warrior Tasks and Battle Drill which have grown “onerous” (according to the general) in the last 6 years and more reflect the requirements of an infantry soldier versus a basic soldier. The Tasks were at 32 and the Drills at 11 when they began their review and many soldiers did not even know what they were. So they have reduced them to 12 and 4 respectively with all Army commands in agreement and they are waiting for the Army Chief of Staff to approve before implementation. He gave the example of training on claymore mines and 50 caliber machine guns which can be better focused training in later courses for soldiers actually using these weapons (most trainees will probably never touch a claymore mine). When asked if trainees were provided training on social media such as Facebook, twitter, etc., he said that the leaders needed the training! In fact, the forum was having a session this afternoon to talk about it. The IMT has a Facebook and Twitter account to help keep those interested informed. He also mentioned that the Army was looking at a pilot study on a CSDA, Connecting Soldiers to Digital Applications (similar to an iPhone). He called the times “exciting” for the Army and the IMT community. The general was concerned about the training stress for the drill sergeants and their families. He said that most (96%) are recent combat veterans. Many return from a deployment and expectations for both the soldier and their family is a more relaxed pace of life and it is far from that. The long days and commitment to caring for the new soldiers can be a tough job but one that is done well by his soldiers! Thank you General for your service and commitment to the training of our soldiers! Interested in seeing more Roundtable interaction? 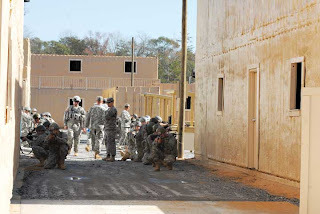 Go to Our Letters to You blog for some very interesting blogs on training, Haiti, Iraq, Afghanistan and other military issues. Please go to DoDLive for an audio or written transcript of the Roundtable! It is only 30 minutes long and the comments are extremely informative! I know that the military 'trains up'individuals... physically and gives them an awareness of lifestyle. I think this 3rd category gives them, and our country such long lasting value. "The third category was the inculcation of values and professional military ethos that most do not have." I thank all of the men and women who set out for this better pathway! We are a stronger country because of that.